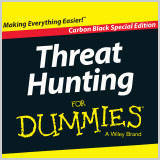 Threat Hunting For Dummies, Carbon Black Special Edition, introduces the concept of threat hunting and the role it plays in the protection of your organization’s systems and information. Many organizations have yet to start a threat hunting program, so this book explains what threat hunting is for and how to get a program off the ground. You will better understand how threat hunting works and why it’s needed. It will become apparent to you that threat hunting is an essential component in an organization’s security program. While threat hunting requires specific tools and technology, a successful program requires far more: motivated, trained personnel; collaboration across IT and the business; a desire to make needed improvements to keep attackers out; local context, environmental understanding, and differentiation between what’s expected and not. In a multi-layered stack of security tools, it becomes a game of peeling or stripping back layers to find the core infection layer.